English Breakfast London is A voguing night occurring once a month in East London. Founded by Sydney "UltraOmni" Baloue of the New York-based voguing House of UltraOmni and Jason "Jay Jay Revlon" Cameron of the New York-based voguing House of Revlon this night brings together performers, dragqueens and dragkings, costume designers, dancers and folks who want to let loose after work and WERQ! 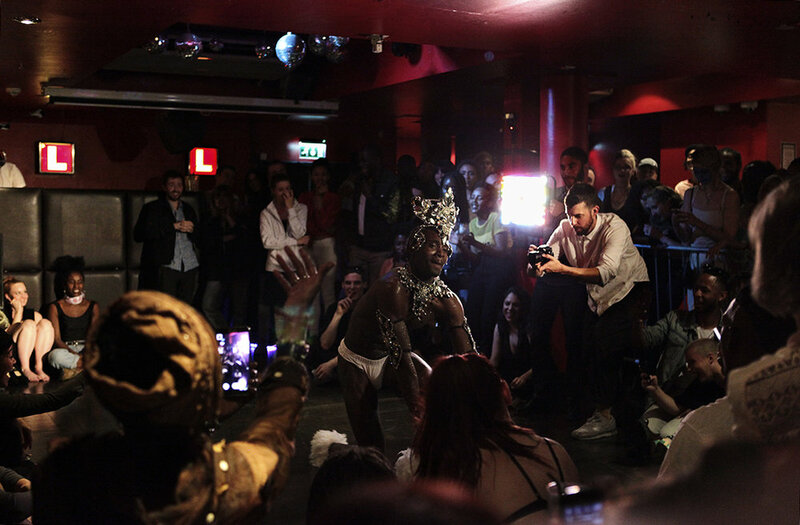 Inspired by "Vogue Knights," the original regular voguing night in New York City, English Breakfast London also serves to be a space to allow folks in Europe's voguing scene to practice getting their 10's, kiki with friends and just let loose and have a good time. With Sydney on the DJ decks and Jay Jay on the mic, the night fuses a club night of hype house music, afrobeats, dancehall/bashment, hip-hop and R&B with a break for attendees to practice competing in different voguing categories. As two devoted and dedicated students to the art and culture of voguing in its truest form, Sydney and Jason have taken London and the European Ballroom Scene by storm with their innovative vision for promoting an unabashedly queer and fun night. Stop by "English Breakfast" when you're in London and be prepared to SERVE, SLAY and GET YO LYFE.